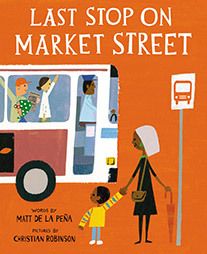 Author Matt de la Peña will present his new picture book, Last Stop On Market Street, on Thursday March 5 at 7 p.m. De la Peña is a rising star in the world of children's and teen literature, and he has won awards for his five previous books -- all young adult novels. Now, de la Peña turns his talents to the picture book genre, creating a book that already has won critical acclaim from The New York Times and starred reviews from Kirkus and Publishers Weekly. Please join us for what promises to be a very fun event that is great for kids, families and grown-ups who love children's literature. Politics & Prose Bookstore will sell copies of de la Peña's books, but the program is free and no purchase is required to attend. Recent NPR interview with the author. The illustrator is Christian Robinson who also illustrated Josephine: The Dazzling Life of Josephine Baker, Gaston, and many other outstanding children's books. Matt de la Peña's YA novels include The Hunted, The Living, I Will Save You, We Were Here, Mexican White Boy, and Ball Don't Lie. He is also one of the authors of the Infinity Ring series. NO LEGO PROGRAM UNTIL APRIL! The next library LEGO event will be APRIL 12. There is NO program in March. Thank you and sorry about the confusion! Graphic novelist Gareth Hinds will talk about his adaptation of Macbeth on Monday, Feb. 23 at 7:30 p.m. Hinds, a Takoma Park resident, has won critical acclaim for his adaptation of classic stories, including The Odyssey, Romeo and Juliet, and Beowulf. His just-published Macbeth recently won a rave review in the The New York Times. Politics & Prose bookstore will be selling copies of Hinds' books, but no purchase is required to attend this free event, which is best for older kids, teens and adults. Three of Gareth Hinds graphic novels are available right here online through our TumbleBookCloud subscription. Just search on hinds. BBC Macbeth from the full series of Shakespeare plays they did in the late 70s, early 80s. Please bring your teddy bears and picnic blankets and enjoy a picnic Sunday, February 22 at 2:00! We will enjoy teddy bear stories, songs, crafts and snacks. Join us tomorrow Thursday, Feb. 19 at 7 p.m. to learn more about the increasingly popular literary genre of graphic novels. Dave Burbank, our library's graphic novel guru, will present the history of graphic novels, and we'll also discuss how they help kids develop key literacy skills. We'll read -- using our document camera and the big screen -- some excerpts from stellar graphic novels, and all participants will leave with a graphic novel booklist. Our program is recommended for parents and teachers; older kids and teens also welcome. The Library is closed today due to the snow and so our weekly Circle Times are canceled. All other City of Takoma Park offices also are closed today. Enjoy the snow, and hope you can curl up with a good book! Yoga & Valentine's Day Crafts! There are still a couple of spots left for Yoga Storytime for 2-4 year olds Saturday, February 7 from 10:30-11:00. No special clothing or gear necessary! Valentine's Day Crafts is Sunday, February 8 from 2-3. This craft program is for all ages. Make a card or craft for someone special! Aphrodite in the graphic novel series. Bedtime Stories is Tuesday, February 3 at 7:00 at the Takoma Park MD Library. We'll be enjoying stories, songs, and a simple winter bird craft at the end. No registration required. Wear PJs if you like! This program lasts about 45 minutes and is targeted to families with children ages 0-4. Korman will talk about Masterminds, the first book in his gripping new series for kids. He has written MANY books, over 80, including mysteries, historical fiction, stand-alone novels and series. Are you a 39 Clues fan? Korman is one of your authors.